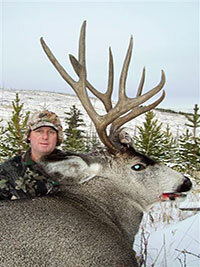 Alberta is renowned for its large whitetail deer, tipping the scales at well over 300 lbs and our area is no exception. We have whitetail bucks in the 130”-200” class and our clients usually see a couple of these giants within range each week along with smaller bucks and does. All of our whitetail hunts are conducted from tree stands or ground blinds, hunting crop or timber country. If a trophy whitetail is what you are after then Alberta is the place to hunt. Bow Hunts run from late August to the end of October. Hunts with other weapons run through November. Alberta is a sleeper for great mule deer and we have some monsters. Most of Alberta is on draw for mule deer and with limited pressure and great habitat big bucks result. We have mule deer in the 140”-200” class and our clients usually see large herds. Most mule deer hunts are conducted by stalking or stand hunting near crop land or logging blocks. If you’re looking for a massive Muley look no further.